Miesje's challenge is to create a card or project either using a Christian symbol of peace, or one that shows or shares peace. Today, our world is anything but peaceful! Nations are not at peace, families are not at peace, individuals are not at peace! Jesus was promising a kind of peace that passes all our understanding, because as human beings living in a sinful world, there is no peace except for this peace that Christ offered. It comes from accepting Him as our Savior and being at peace positionally with God! That is TRUE peace and it is a gift of God, and can only be experienced by knowing Him, and being in right relationship with Him. Then our souls are at rest. Then we know true peace! With our souls secure and our future sure, we can face uncertain days, challenges in our every day lives, even BIG problems knowing that God is in control and will work all things together for good for those who love Him and are called to His purpose! Our priorities change, and our troubles take a back seat to the greater joy of knowing He is GOD, and He is in control. The whole world may seem out of control but rest assured my friends, He is in control and He can be trusted with your littlest struggle, and your great struggles! He desires to give you that peace and rest in Him. My wish for you is that you would know that peace and that joy! With those thoughts in mind, I decided that I'd make a Christmas card using Our Daily Bread designs Peace and Joy set. I just love this snowflake set and this year, we have a special treat because Kelley is soon releasing a custom die cut set for this stamp set! Talk about making a laborious task go quickly!!! Wowza! Anyway, this new Snowflake Die set will be available Oct. 1! The card is on a caramel base and then I matted with Very Vanilla, punched down one edge with a Snowflake Martha Stewart punch, then I used my favorite Graphic 45 DP. That became the inspiration for my color scheme. I stamped the snowflakes with More Mustard on Very Vanilla and gave them a light "wash" with a water brush to give more of that yellowish tone of the dp. I cut them out with the dies, super quick... and then used the new Spellbinder's Snowflake Pendant from VV again, and the large die from Spellbinder's Create a Flake set from Caramel. I layered them all together with dimensionals. For my sentiment, I stamped with Adirondak Latte and cut with Spellbinder's Fancy Tags. I cut a second tag from caramel CS and mounted slightly offset for a shadow effect. The gold pearls finish it off (Queen & Co). Our sponsor this week is Designed 2 Delight Digitals. Be sure to check out the Stampin Sisters in Christ Blog for all the details! Thanks so much for stopping by! Have a peaceful and blessed week! This is beautiful Grace, such soft colors and beautiful design. A new die did you say? :) Then I must put this on my wish list. wonderful insight into the devotional this morning. WOW Grace, this is wonderful! I just love that card! Your cards are always amazing! Have a peace filled week! Gorgeous Dies Grace- your card is absolutely STUNNING! Hope you are having a blessed day! Stunning cards Grace, both this and the post below! Not the usual Christmas colors, so unique and so lovely! Thanks for your meditation on peace. As always your messages are meaningful! What a beautiful write up Grace.. It is so true.. I would love a more peaceful world.. Your card is pretty in all the browns and cremes.. How exciting to get a new die..Have a wonderful Sunday..so thankful for this amazing rain. love that snowflake and am excited about the die, maybe have to make it on my wish list! Enjoy your Sunday, and blessings! What a stunning and elegant card Grace!! I so love your colors and the added details. You sure demonstrated the real beauty of the die!! Your words are so encouraging and true!! Such an inspiration for all who read. Stunning card, Grace! Absolutely gorgeous!!! Everything you said about peace resonates with me. It's what gives me joy... that peace that passes all understanding that is only found in Christ our Lord. My heart grieves for those who don't know that peace. What a wonderful idea, making a Christmas card! Thank you for sharing your gorgeous creation, and your words of wisdom with us. What you say is so very true. Makes me think of that "Know God, know peace, No God, no peace" saying! I like all the soft colors on this, rather non traditional but yet so Christmasy too . . .the colors remind me of the stable and the straw I think, that's why they're comforting and homey. Thanks for your thoughts as well, always on target. Have a blessed week! this is just beautiful! The colors, that snowflake, the pearls, it is just beautiful. Gorgeous! I love the creams and browns with the snowflakes. You make me envious Grace!!! (just a wee bit of green here). Elegant to the max!! and the colors are so warm and inviting...just the way it should be done!! TFS!! "With our souls secure and our future sure, we can face uncertain days, challenges in our every day lives, even BIG problems knowing that God is in control"
Amen my friend. And your card definitely is peaceful. 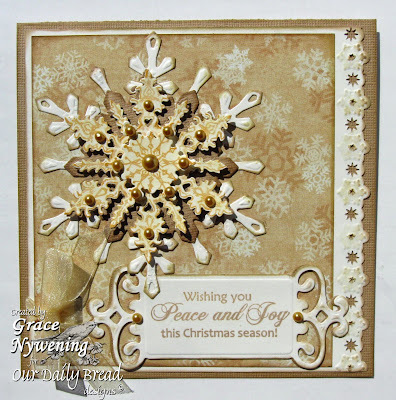 All the layers of the snowflake and all the intricate cutting is fabulous Grace!